1 What is your daily skin care routine? 2 What is your weekly skin care routine? 3 How do you prep your face for makeup? 4 How do you take off your makeup? 5 What are some DIY face masks? 6 What are some inexpensive makeup brushes? 7 Do you prefer matte or shimmer eyeshadows? 8 Do you prefer matte or dewy skin? 9 Do you prefer matte or shiny lipstick / lip gloss? 10 Lipstick, Gloss, Lip Stain, Balm, or Lip Liner? 11 What type of coverage do you prefer from a foundation? – I like my foundation to be medium to light. I’m definitely not keen on heavy coverage foundations. 12 What cosmetic brands you always wanted to try but haven’t? 13 Do you wear fake lashes? – I do, usually for more special occasion and I do collect them. 14 What type of product do you buy the most of? 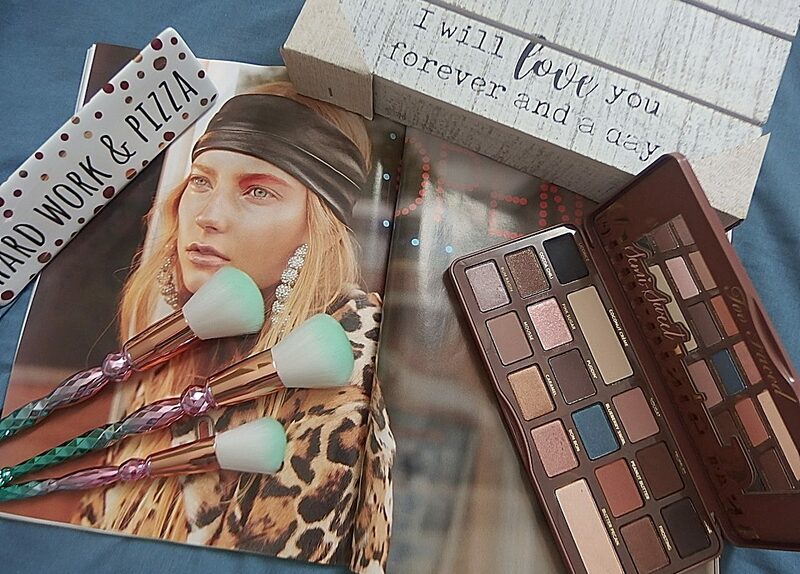 – I’m obsessed with eyeshadow palettes and anything eyes related so you’ll probably find me buying some new eyes product. 15 Do you like trying new skincare products or do you keep a certain routine? – I prefer to stick to same skincare routine, but I like to try something new every now and then. My take on this tag, I love how makeup makes me look good, polished and how it completes any outfit from outside in. Makeup makes me happy! When I do wear makeup I always emphasize both eyes and lips, which is unacceptable for many, but I think it looks great on me. I like to “break the rules” sometimes when it comes to makeup and I enjoy every single part of it. Hope you’d enjoyed reading this post as much as I did doing this tag. Thank you so much for stopping by to read. Until next time, have a great day and stay beautiful! I like to buy a lot of eyeshadow palettes too! I loved reading your answers to this tag! We would have very similar answers 🙂 I also love collecting eyeshadow palettes! I always have some kind of chapstick or lip gloss and mascara. I’m pretty basic on my daily routine. Thanks for sharing this tag. It’s so interesting to read about other bloggers beauty routines and to see how you compare or what you have in common. You’re welcome, my dear! So glad to hear that. My routine is usually just a facial wash and moisturizer and that’s it. Exfoliating once a week is great especially if you commute everyday. I think it’s nice that you shared these with us! Aww … thanks so much Elizabeth for your comment. That’s so sweet! I like to play up my eyes and lips too! I think I can still pull it off. I love to read about others beauty tips. I need some new fresh tip from time to time. Thanks! awesome questions! i like answering post like this too!! Aww that’s so nice to hear! I’m sure you’re going to like doing this tag. My beauty routine is simple. Wash, cleanse, tone, moisturize. I am not much of a make up person but if I do need to wear make up, I go for earth tones. Me I always make sure to take off my make-up before going to sleep. Its a must for me. I love finding out about others routines and favorites. I have not really done much in the ways of beauty, makeup and such; until the last few years. My go-tos are lipbalm and mascara. It is enough to pick me up on off days. These questions and responses are so helpful. Makeup can often be confusing without an expert’s opinion to guide you! I’ve never realized until reading your post that maybe I should be trying so many different products. I’d like to find some that work and mix in new ones now and again. Except eyeshadow. I love buying it everytime I see new shades. I’m going to do this tag! I’ll link your post to it! This was so fun to read! Thanks for sharing!